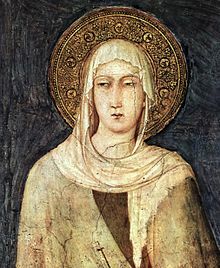 Saunt Clare o Assisi (Julie 16, 1194 – August 11, 1253, born Chiara Offreduccio an sometimes spelled Clair, Claire, etc.) is an Italian saunt an ane o the first follaers o Saunt Francis o Assisi. This page wis last eeditit on 9 September 2017, at 19:43.